From the personal assistants in our mobile phones to the profiling, customisation and cyber protection that lie behind more and more of our commercial interactions, AI touches almost every aspect of our lives. And it’s only just getting started. Drawing on detailed analysis of the business impact of AI, our analysis challenges the hype around AI. Whether you love the robots or fear them, there’s five things you need to know. 1. It’s about more than automation. The greatest commercial potential of AI is doing things that have never been done before, rather than simply automating or accelerating existing capabilities. While disruptors like Netflix have used AI to reshape their sectors and start-ups such as Climate Corporation have built new business models around it, AI still operates at the fringes of many businesses. We now have systems that can see, hear, speak, smell, feel, understand our gestures and interface with our brains. These ‘senses’ channel data to ‘brains’ capable of processing volumes of information that are beyond our human comprehension. To be successful, it’s important to implement AI as part of your business transformation strategy. And as our research published at Dalian shows , the size of the prize is great. 2. AI is helping make better decisions, and solving problems. More than 60% of the 2,500 consumers and business decision makers in the US, who took part in a PwC survey on attitudes to AI , believe that it can help provide solutions for many of the most important issues facing modern society , ranging from clean energy to cancer and disease. Indeed, our new analysis shows healthcare, automotive and financial services are the sectors set to receive the biggest boost to product value from AI, reflecting the openings to increase customisation, enhance quality and save time for consumers. 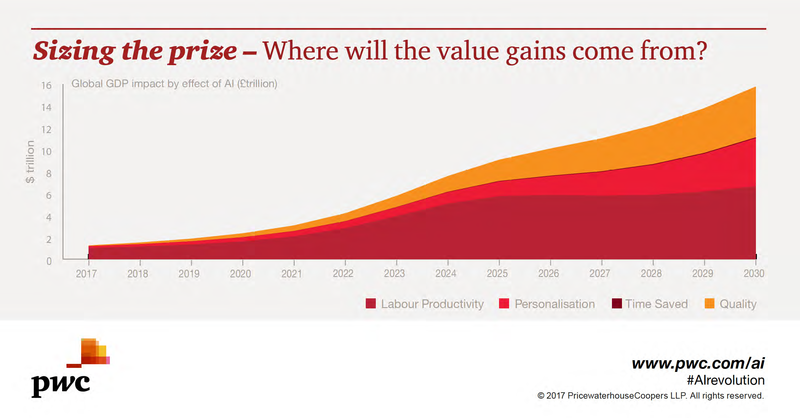 The greater the interaction with the consumer and the more data this generates, the greater the opportunities for customisation and other value gains of AI. The front runners will be able to tap into consumer preferences, tailor their output to match these individual demands and in doing so, capture an ever bigger slice of the market. We can already see this happening with the way books, music, video, and entertainment are produced, distributed, and consumed. 3. It’s personal, so trust matters even more. Our research found that 58% of the economic impact of AI will come from impacts on consumers and their behaviour. AI enhanced products and services will be more personalised, of a higher quality and save consumers time. At the heart of the commercial potential is the ability to turn data into insights, insights into decisions, decisions into actions, and action into outcomes and hence open up opportunities for innovation, personalization and improved functionality. As consumers, we need to understand AI’s decisions, and how it is using our data. From an organizational and governance perspective, we need to be thinking about what frameworks need to be in place for transparency around the role of AI – whether it’s in how it will be deployed, regulated, or the data it analyses and manages. AI should be able to explain its logic in a way that a common man can understand. Regulation will have to speed up and be responsive to both consumer, business and societal needs. One of the main advantages of AI comes from humans working with machines, helping us to learn better and faster than either one alone. While the adoption of 'no human in the loop' technologies will mean that some posts will inevitably become redundant, others will be created by the shifts in productivity and consumer demand emanating from AI. In addition to new types of workers who will focus on thinking creatively about how AI can be developed and applied, a new set of personnel will be required to build, maintain, operate and regulate these emerging technologies. All of this will facilitate the creation of new jobs that would not have existed in a world without AI. AI is a continuation of the economic boost from digitisation, rather than some magical new breakthrough. Now that the internet, big data and increases in computational power are embedded into the global economy, their contribution to growth is receding. AI is stepping into the breach by sustaining and, in some areas, accelerating the economic boost from digitisation. Companies that exploit the ‘machine learning advantage’ stand to become the leaders of tomorrow. The unsupported hype that so often surrounds AI compounds strategic uncertainty in companies, and consumers about the role and impact of AI. It’s not ripping up the rule book: it’s writing new pages. Responsible and responsive leadership - the theme this year in Davos - to allow business and society to adapt to a digital world, particularly around AI, will be crucial. Policy makers have a role to play in proactively creating the environment where AI is responsibly adopted, encouraged and applied, to ensure the transition protects livelihoods and prevents the widening of inequality due to the application of technology. In the same way that no two friends are the same, don’t make the mistake of looking at AI as just one thing. This is a revolution in how we use information. We’ll get as much out of the relationship as we put in.